Surrealism and magick: Throughout the long dark history of humanity there have been magi. While some are known for their works, be it art or literature, there must be countless men and women that have either failed to develop their innate gift or have succeeded in mastering it while keeping silence to the end. Of those that fail to develop the gift (or curse)—whether by refusing it, fleeing from it in horror or becoming insane, there is little to be said. Of those that master it, whether partially or fully, some are known and others will never be known since they did not utter a word. The word of a magus is irrevocable, as we shall see, though it is said that failure to utter a word is equally irrevocable since it must beget an abortive child. The momentum of the immense forces that first push the soul onward and then draw the soul inexorably inward towards annihilation of ego identity is sufficient to split the atom or, in psychic terms, to fragment the soul until its very name is forgotten and it endures dispersion and ultimate oblivion. The magical child, however, of which it is the object of the art of magical alchemy or of the Great Work to produce, is not the result of any cause. The ancient chestnut of determinism has become a poisoned apple in the hands of modern philosophers and rationalists. The magical child of consciousness—otherwise termed the True Will—grows as a seed in the silence of the womb of the cosmic Matrix. The fruit and the flower, nonetheless, has preexisted the seed. For this reason, the magi have oft been reported as stricken with awe at the sight of a portentous star where no star previously was seen, or plunged into rapture at the sight of a wild orchid blooming in a desert where a single drop of rain would amount to a miracle. The avoidance of conscious intention in producing works of art so that subjectivity forms the primary basis of the work. Automatism was not an invention of the Surrealists, or of Sigmund Freud, but has always existed in magick and alchemy. Among the finest examples are the sigils or magical signatures of the Qabalistic Intelligences and Spirits of the planets as given by Cornelius Agrippa in Three Books of Occult Philosophy (1531) and centuries later copied into The Magus, by Francis Barrett (1801). These beautiful designs, along with other more abstruse signatures that can be found in medieval grimoires, were written on virgin parchment by the hand of the spirit, not that of the scribe. We also have the evidence of the Enochian language received through the invocations and skrying of Elizabethan mage John Dee and his assistant seer, Edward Kelley. Occult artist and writer Ithell Colquhoun—a friend of André Breton, Aleister Crowley and later, Kenneth Grant—was a member of the Surrealist School. 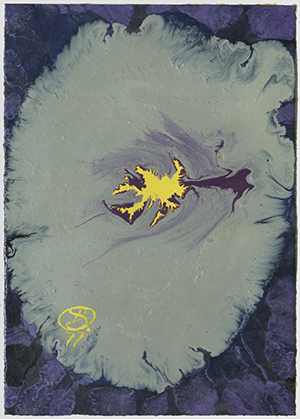 Ithell Colquhoun defined her use of automatism as super-automatism, presumably to distinguish the method from the same term that is used in psychiatry and law. We shall from hereon adopt the term as used by Colquhoun, super-automatism, when we are referring to spiritual, magical or artistic method or even natural inclination. This is a highly interesting example of genuine automatic writing. Crowley later insisted the book was dictated by a praeterhuman intelligence named Aiwass, his Holy Guardian Angel. In fact, there need be no essential contradiction between magical super-automatism and contact with a praeterhuman agency. Crowley was very sensitive, however, as to how the book might be viewed by posterity. He did not want what he considered to be his most important work compared with drawing room séances and psychism. Psychic automatism in its pure state, by which one proposes to express—verbally, by means of the written word, or in any other manner—the actual functioning of thought. Dictated by thought, in the absence of any control exercised by reason, exempt from any aesthetic or moral concern. The artist invoking a paranoid state with the intention of deconstruction of the psychological concept of ego-identity. Paranoia is taken to mean the fear that one is being manipulated or controlled by others. This may of course include the paranoid manipulation of others. 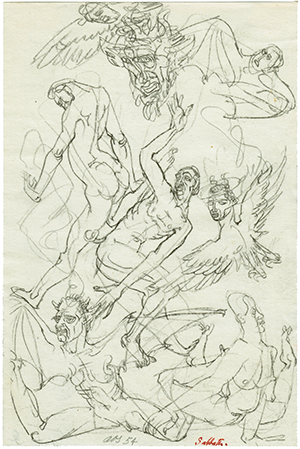 Some of the tricks that Dali liked to play were very much inclusive of the ‘audience’, so the boundaries between who was doing what to whom were blurred, increasing the paranoia for all concerned! The aim of the method, however, is that subjectivity becomes the primary basis of the work. It is to defeat the rational mind, prohibitions and censorship that stem from ego. Ithell Colquhoun (1906–1988) described her work as “mantic”. Mantic means, ‘pertaining to divination or prophecy’, and is derived from the Greek, mantikos, ‘divination’, mantis, ‘prophet’. Unlike other artists, Colquhoun deliberately wished to connect Surrealism with magick, both philosophically and in terms of method or technique. In her own writings she drew comparisons between visual art and the medieval art of alchemy. Colquhoun wanted to achieve a union of natural and spiritual forces as well as a union of the disciplines of art and the occult. The union of subject and object, the I-Self with all that is ‘other’, the Not-Self, is the goal of yoga or union, and is a prerequisite for magick and mysticism at advanced levels. Thomas De Quincey employed a type of super-automatism, comparable to Salvador Dali’s paranoiac critical; in so doing, De Quincey may have endured, and attempted to describe in his writing, the equivalent ordeal in a Rosicrucian Hermetic fraternity called the Curse of a Magus. Any attempt to describe the indicible is doomed to failure, hence the “curse”, for as cleverly suggested by Aleister Crowley in his The Book of Lies, there is a certain obligation to speak truth even while knowing full well it will be fatally misconstrued or otherwise perceived as alogia or simple incoherence. If in this world there is one misery having no relief, it is the pressure on the heart from the Incommunicable. And if another Sphinx should arise to propose another enigma to man—saying, What burden is that which only is insupportable by human fortitude? I should answer at once—It is the burden of the Incommunicable. Extracts from the book, The Magical Art of Surreal Romanticism. This entry was posted in Magick, Surrealism and tagged Aleister Crowley, arts, Austin Osman Spare, automatism, confessions, Dion Fortune, Hermetic magick, Ithell Colquhoun, Kenneth Grant, Max Ernst, occult, Qabalah, romanticism, Salvador Dali, surrealism, Thomas De Quincey, Western Tradition by admin. Bookmark the permalink.